When you think about the most common exotic vehicles made in the last ten years, which are the first three that come to mind? It is most probably the Ferrari F430, Lamborghini Gallardo and Audi R8. Now that more clean examples of these vehicles are readily available at attractive pricing, it means that more people are likely to modify the hell out of them for track or street fun. 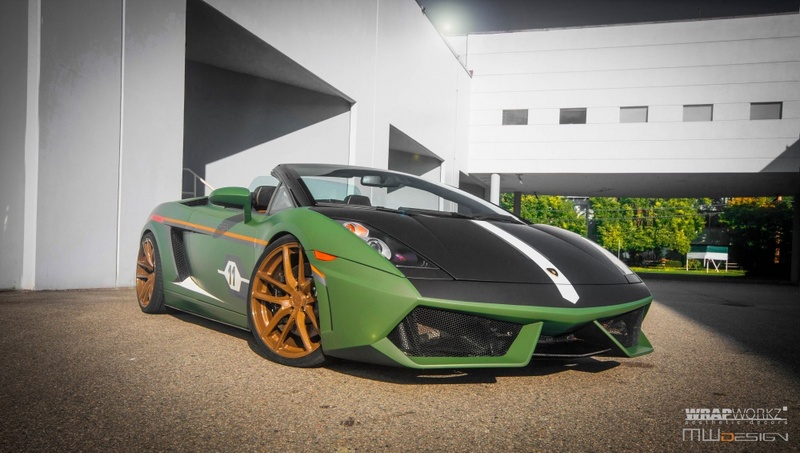 Attivo Designs contracted us at MWDesign to come up with a unique concept to feature the new aluminum and carbon fiber active wing that we are developing for their Gallardo “Ultimo” project. The concept of the project is based on the fusion between a military and racing background. 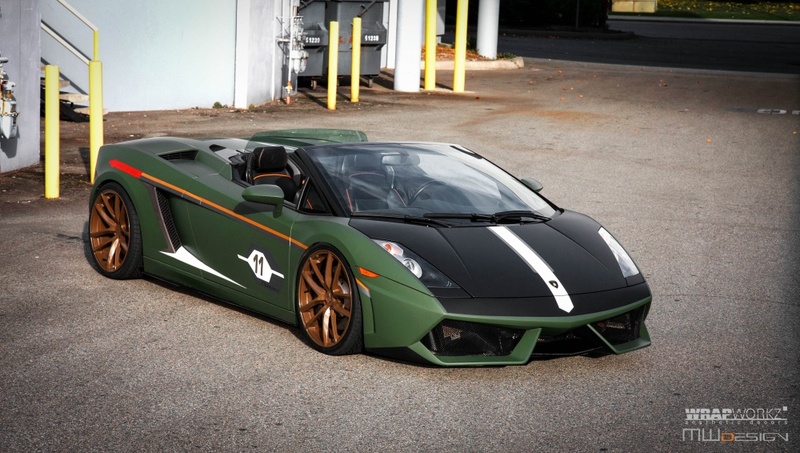 The design features a multi-layered vinyl wrap, which was executed with precision craftsmanship by Wrapworkz Vancouver. 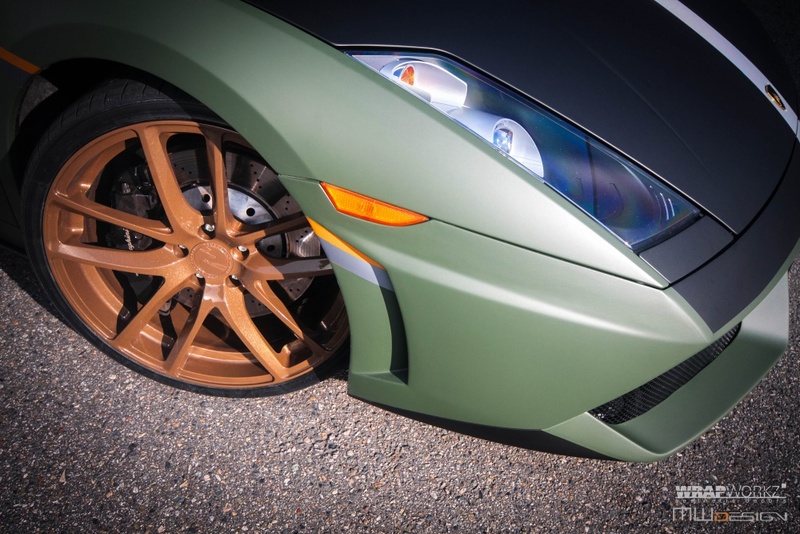 The base layer is a 3M matte military green, with secondary contrast with a matte black sculpted hood that cuts into the pointed “Performante” styled front. The side applique features a hexagonal race number derived from Lamborghini’s 50th anniversary insignia, layered in matte grey and reflective white. The number “11” signifies the company CEO Robbie Dickson’s age he entered the world of engineering in England. The side vent, character line and accent colors harken to the matte green Harrier Jump Jet of the Royal Air Force. There is a brushed bronze and grey stripe that lead into a translucent red warning arrow, which will perfectly highlight the active wing once complete. The side vent and character accents are layered in reflective black and white to create a minimalistic camouflage feel without being too explicit. The perfect match for this theme was finished by details such as gloss black powdercoated exhaust tips, reflective white and black top character stripe and 20x9, 20x10.5 Modulare B18 finished in a special gloss bronze/brown powdercoat to transition from the green body and compliments the reflective black nicely, which also shares a brown hue in the light. 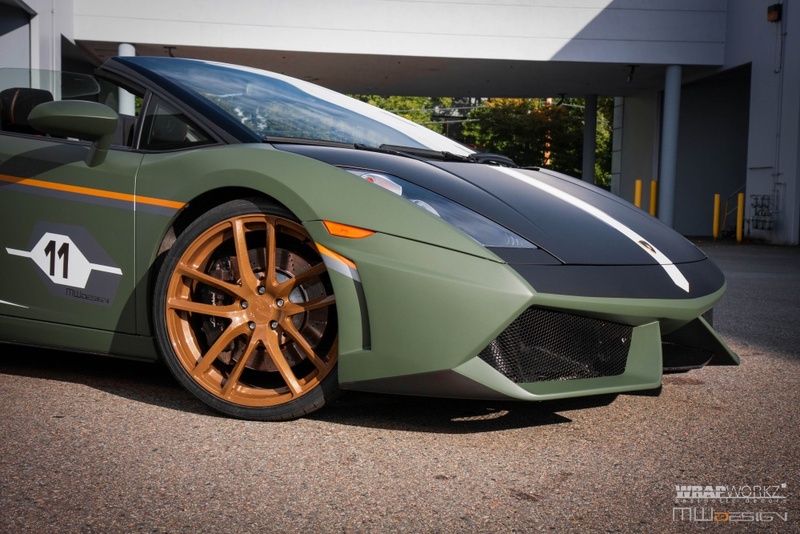 The aerodynamics on the Gallardo “Ultimo” are carbon fiber and based on the 570 Performante front. The wing will feature an etched and anodized aluminum shell, aluminum skeleton and hydraulic actuators to lift a carbon fiber upper spoiler wing as an airbrake. Stay tuned for news on the completion of the Attivo active wing!